Pontiac Street Performance - Best aftermarket Quadrajet on market? And would it be a problem mounting it on a Edelbrock performer intake? I'm running a Holley 600 cfm on it now. It's a 400 crate, 6x heads, don't know the cam but it does thump a little. After a lot of reading about carbs my head is spinning, but I'm getting sold on the Quadrajet. I thank you for any thoughts or just plain comments. Oh... reason.... car feels great off the stoplight but seems to want a bit more fuel down the stretch. I just installed new stainless 3/8 line from tank to pump also. What is the S, in Custom S ? If that's the case, with the right gasket, should bolt right on. Also my block is a 75, and I have headers and flowmaster 50s. Looking at the JET Q jets in stage 2, DO you feel the 750 or 800 would be a good fit? On the q-jet the 50 cfm difference is slightly larger primary venturi's, by like 1/32" IIRC. The smaller carb is said to give more control over the idle circuit. The newer q-jets 1976-77 (800 cfm's) have distinct advantages in float geometry and well plug sealing. Also the front fuel inlet, pontiac, olds, and buick carbs are more user friendly because of pontiac fuel pump location. I prefer the un-molested greasy grimy take-off carbs. Then clean and install one of Mr. Cliffs carb kits. Or let Mr, Cliff build it to your application. There are not that many parts inside a q-jet if your feeling frisky..
Cliff's Q-jet book is an excellent reference. It includes what to look for when selecting a carb, history, techniques, and modifications. TH400/ 3.08 8.5 / R44TS. I haven't seen a qjet rebuild larger company that didn't cut corners or mismatch things. Of course, i don't find out until later because i don't know what i'm doing that it's crap. I see you're in Ohio by Cle! I'm over north of ytown. You have two choices if you don't want to do it: send it to cliff out by you, or send it to benchwick's in youngstown. Harry at benchwick's is a little cheaper but i've never had a carb done wrong by him. Any time i get an old car, its carb is going to benchwicks whether it needs it or not, cheap insurance. The cliff carb i had was worth it as well, and IMHO, when you see a pontiac for sale in the pontiac circles, having cliffs carb on it makes it a little bit better deal. From what I hear,aftermarket Q-jets are inferior to a good old rebuilt one. Never bought a "new one",just going by what I read on this. But, Problem is,as Blued noted,you want an old unmolested one to start with. Getting harder to find these days,but they're out there. i.e. 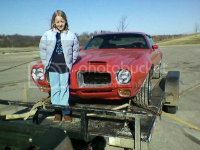 I bought a '73 Firebird Q-jet off of a local guy for $20. It was supposedly the original from his '73 Bird. When I tore it down for a rebuild it was a mess inside. I sent pics to Cliff and he said it looked like it was soaked in some strong solvent that the "crank em' out" rebuilders use. The top of the accelerator pump well and the top of the power piston retainer area was eaten away. It's a parts carb now. I bought a whole box full of carb cores years back for $25 from a Craigslist ad. 5 Q-jets and 2 Holleys. I found an unmolested '76 Buick Q-jet with APT in the box,that's what I ended up using. I just picked a complete "greasy grimy" q-jet like B&P mentioned for 25$ at spring Carlisle, off an 80 Buick. A kit from cliffs and I'll be into for a little over 100$ and have a good carb that I rebuilt. I'd never pay big money for one that I can rebuild myself. 78T/A 4-SPEED Marty blue 400/milled 6x-4's/268H,comp roller tip rockers/ performer/ Q-jet/RA manifolds 2.25" exhaust with x-pipe/ mine since '99 3rd & final owner as long as I'm alive. "Let me tell you what Melba toast is packing"
Hope it goes well. Keep us informed. What year did they start with the electronic metering rods. Thanks for the response I'm scouring Cleveland Craigslist and other things. Might as well give it a try. I don't know why i didn't think of this before now. I HAVE a rebuilt quadrajet on the shelf, about 5 years old now. I was running it while waiting for my cliff carb. It's front inlet, shelf dusty now. It ran great BUT it had a slight whistle at idle, going into the feed for the idle air bypass, IIRC. I had a thread somewhere, i'll see if i can find it. It didn't affect operation at all. IMHO, likely an idle air passage that needs cleaned or the orifice is malformed and would need peened and drilled to make round. I didn't chase it down. I have a bit of change in it, i'd sell it for $100 and you're fairly close. If you're interested i'll get the numbers off it. Link: Ignore rough idle, wasn't related to carb. Al, what max. rpm are you shifting that 400? I've had decent results with the 600 Holley VS carbs on 350's but it can be a bit of a stretch on a 400 depending upon the rpm your taking it to. Qjet no problem on either of your intakes and you can also lose the squarebore adaptor plate in the process. My first choice for Qjet work is Cliff as I have dealt with him over the years for parts as well as a few Qjets he built for me in the earlier days, all of which were flawless and are still in operation. SMI has a good rep too and may be quicker if you're pressed for time but check on their backlog as well. Bowties are for Pee-wee Herman. LS swaps in Pontiacs should only apply to Fieros. hope you all had a great summer and fall ! So I settled on the Street Demon 625 cfm with the poly body. Before starting I installed a Holley pressure regulator and Holley inline 10 micron filter. Glad to hear a report on these. They seem like they'd make a decent street carb, i liked the design when i saw one of them at summit. Thanks for following back up! What air cleaner assembly are you using with that Street Demon? I had concerns about the shape of it interfering with low profile and drop base air cleaners.